The e-pill MedSmart Automatic Pill Dispenser is a convenient, user-friendly device to help take pills and vitamins properly and on-time. MedSmart is available in two versions. Stand-alone or PLUS (monitored with no monthly fees). Your MedSmart should be kept locked at all times. Watch the MedSmart YouTube VIDEO. At each reminder/alarm time (up to six times per day), a flashing light and sound alert will remind the patient that it is time to take your pills, the tray will rotate, and all medications for this time will be made available. Tip the unit (turn upside down) to dispense your pills and the device is ready to dispense the next dose at the scheduled time. If you are using the MedSmart PLUS, message(s) will be sent to the caregiver(s) if meds are late (after 60 minutes). MedSmart Easy to Setup. 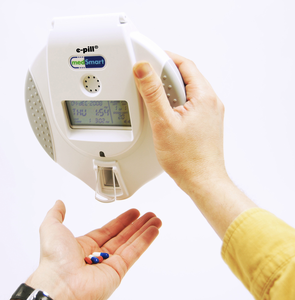 Simply program the Medication Alarms from 1 to 6 times per day in accordance with the patient's dosage schedule. The circular tray has cells for you to organize pills. Select the appropriate Dosing GUIDE (disk) that corresponds with the dosage schedule and fill the tray accordingly. Close the MedSmart device, lock it and place it on the docking station.